How much would you sacrifice for a chance to achieve your eventing dreams? Eileen Cody checks out Mary Pagone’s Quick Bright Things Come to Confusion, in which a hungry event rider comes head to head with this question. Quick Bright Things Come to Confusion is the second in Mary Pagones’ Fortune’s Fool series. Although I learned the hard way (translation: realized about a chapter into the book that it was, in fact, a sequel) that it’s not completely necessary to have read the first book, Fortune’s Fool, to understand this one, it would probably provide some helpful context. And if it’s as enjoyable a read as Quick Bright Things was, I’d highly recommend it. The story opens with Simon just starting a job as a working student at the barn of a highly regarded German eventer, where he’s stepped down from being a big fish in a small pond at his previous barn to, in his words, “not even phytoplankton.” However, his luck seems to turn when he helps catch a runaway horse at an event who turns out to be the new project of top U.S. eventer Matt Stevenson. Matt offers Simon a job in the hopes that he can help him train the runaway, Milton Keynes, who is as talented as he is unpredictable. Despite a warning from his old trainer about Matt’s less-than-stellar reputation, Simon can’t resist the temptation of having an upper-level horse to work with, and he leaves his unsatisfying working student job behind to jump at Matt’s offer. Simon clicks immediately with the wayward Milton, and the pair soon begin to make their mark at the Advanced level. But the more time he spends at Matt’s stable, the more he clashes with the trainer, whose reputation for putting winning ahead of his horses’ welfare turns out to be well-earned, and Simon soon finds himself out of a job, without a horse to ride, and worried for Milton’s uncertain future. I can’t say the experience of wanting to slap a fictional character in the face is a new one for me, but boy, does this kid need an attitude adjustment. The author does an excellent job of immersing the reader in Simon’s thoughts using the first person (a narrative structure that I’m not always a fan of, but it worked well for this type of story), which only serves to emphasize from the very first page just how highly he thinks of himself. He has the talent to reach the top levels of eventing but lacks an ounce of the necessary humility to get himself there. Still, assuming that I’m not just projecting and that Pagones was intending for Simon to be kind of a jerk, I did find his unlikeability refreshing. Flawless protagonists are boring protagonists, and Simon is compelling as a character not in spite of his flaws but because he’s so deeply imperfect. While I never quite reached the point of empathizing with him, as his misfortunes throughout the book are almost entirely a product of his own decisions, it was all the more satisfying to see him begin to acknowledge his mistakes after his fall from grace and attempt to make a fresh start. 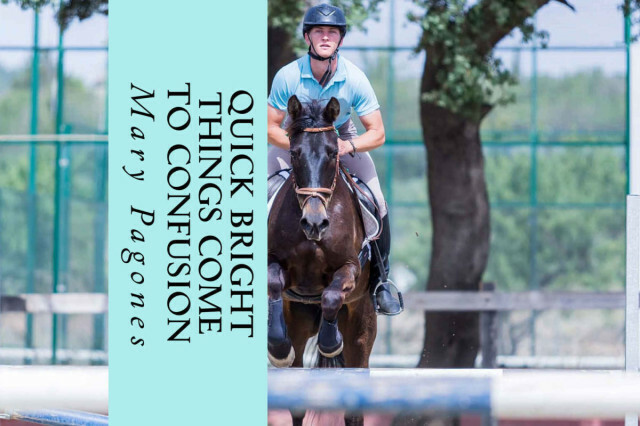 Overall, while I’m not about to call Simon up to hang out anytime soon, Quick Bright Things Come to Confusion is a fun and exciting read for any eventer (or eventer wannabe). 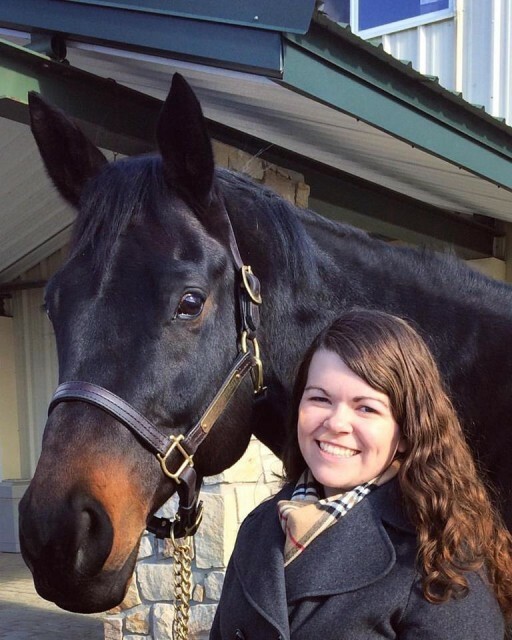 Pagones’s visceral storytelling style, combined with her attention to every last horse-related detail, helps the reader feel like they’re right there along for the ride. Quick Bright Things Come to Confusion is available for purchase at Amazon.